I first made dumplings with my wonderful friend Xin Li in graduate school. Known as Mama Xin in my little lab of beleaguered grad students, Xin had moved to the US with her husband and daughter from China about 3 years before we met. She knew the dumplings were my favorite, and would bring them to me if she knew I was having a hard time in the lab. The day after the funeral of my best friend, there was a hot plate of dumplings left for me with out explanation on my desk. I think I cried for about a week over that. Asian Dumplings are comfort food, as sure as a big bowl of the puffy Bisquick variety. Combine soy sauce, chilé garlic sauce, and white wine vinegar. Slowly wisk in a thin stream of sesame oil (about 2 tsp). **Meaty alternative: Combine 1 lb ground pork, ½ cup green chopped green onion, 2 tbs soy sauce, 2 tbs hoisin sauce, 2 tsp sesame oil, 2 tbs chilé garlic sauce. Use this instead of the tofu/cabbage mixture. Drain water from tofu and then crush the entire brick in a large bowl. Add shredded cabbages, carrots, ginger, shallots, hot sauce, soy, hoisin, cilantro, and green onions. Mix, just to bring together. Taste the mixture and re-season as desired. You want a dry mixture. No liquid should pool in the bottom of the bowl. In a small dish combine water and corn starch. Prepare an area in which to assemble the dumplings. You will need: A large plate on which to work, a cookie sheet lined with wax paper (plus additional wax paper for additional layers), a small soup spoon, raw goyza wrappers, and a clean dry cup towel. With the area set up: place a single goyza wrapper on your work plate. Place about 1 tbs of the filling in the center of the wrapper. Dip a finger in the corn starch and water mixture, making certain to mix the solution a little. Shake off most of the excess liquid, then run the finger around the bottom edge of the wrapper only. You want to just barely wet the wrapper, not soak it. Wet the edge of the wrapper. Dry your fingers using the clean cup towel. Carefully fold the top half of the wrapper down to meet the bottom. 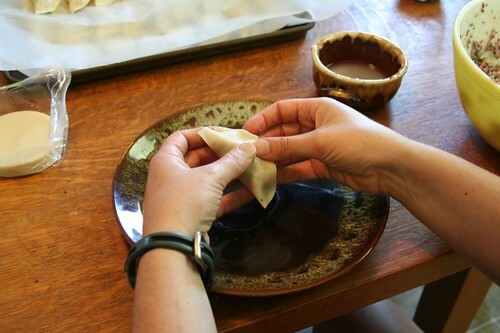 Then pick up the wonton, and use the fingers of one hand to gently seal the edges. You aren’t trying to press the dough together, only use the corn starch/water mixture as glue. Carefully press out bubbles. Try not to get the filling in the seam as this will prevent it from sealing. 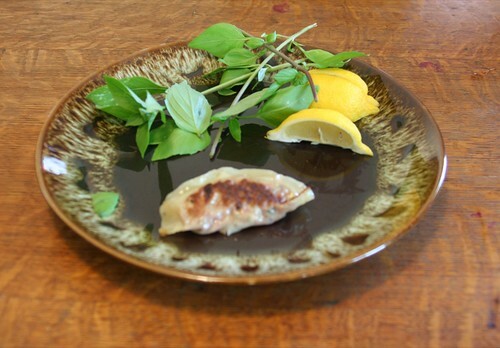 Place the folded wonton on a wax paper lined baking sheet. Separate layers with an additional sheet of waxed paper. If you don’t wish to use all of them in one day, place the dumplings in single layers in your freezer. When they have completely frozen through, you can bag them and save them in the freezer for about a month. 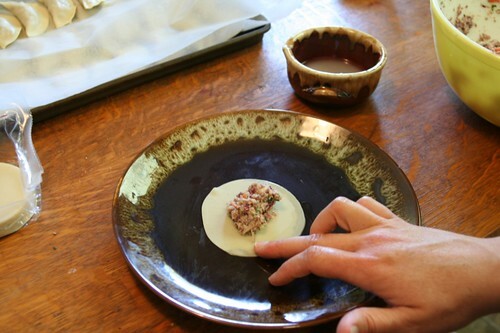 Between the assembly of each dumpling, wipe your plate with the cup towel. You want a dry work surface. Heat a large dutch oven over medium high heat. Add about 2 tbs of canola oil to the bottom of the pan. 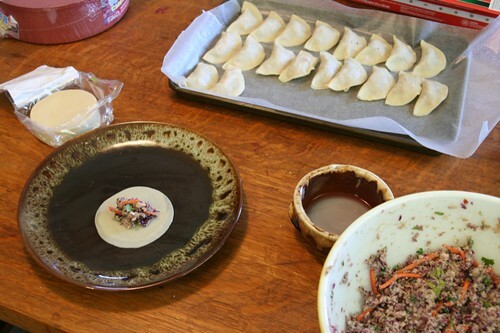 Place folded dumplings, one at a time, in the hot oil. DO NOT TURN. Clamp a tight lid down over the dumplings and let them cook for about 1 minute. You are actually encouraging the dumpling to stick to the bottom of the pot. Hence the name potsticker. Lift the lid from the dutch oven and add about ¼ cup of cold water to the pan. Clamp the lid back on and cook for an additonal minute. This will unstick the dumpling from the pan. If you are using a meat filling make certain it has time to cook all the way through. Serve, burned side up, with the dipping sauce. I actually prefer the meat filling here. Somehow the tofu will always be just a tiny bit too watery for my taste. I like this tofu filling though. It’s got plenty of flavor and is virtually guilt free as far as calories go. If you don’t want to use the pot sticking method, you can steam the dumplings using a metal steamer basket, a spray of olive oil, and a big pot. If you would like to boil the dumplings (more precisly you would poach them): bring a large pot of water to just under the boil. Stir the water slowly with a large spoon to create a vortex. One at a time, gently drop in the dumplings and cook for about 3 mintutes. Strain and eat. I lived in Athens, Ga for a little while after grad school. I guess I really didn’t want to be there for long, because I just about refused to make friends or come up with any kind of social life while I was there. Instead, I holed up in my little duplex with my dog, and some really good Thai take out. That year, I fell in love with Tom Yum soups. The blend of acid and heat is something I particularly love. The following soup was meant to be a cross between my chicken noodle soup, and my thai favorite. 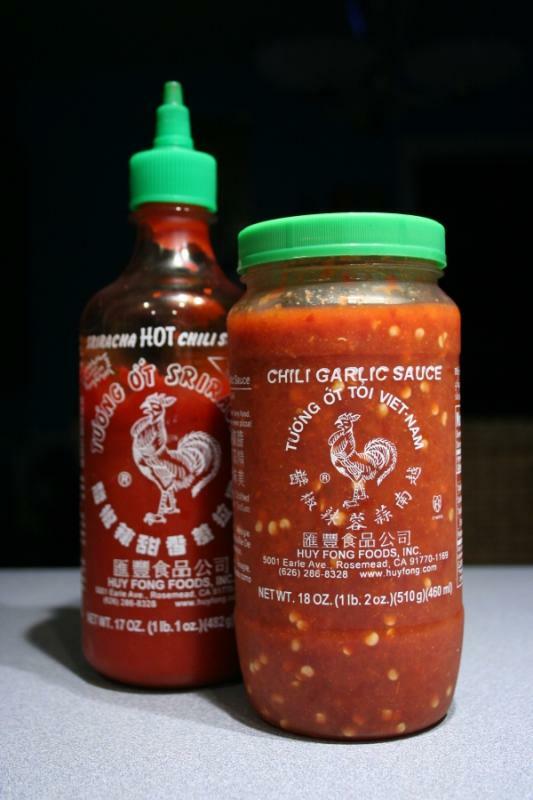 It relied heavily on everyone’s favorite Vietnamese hot sauce. I used the chili garlic sauce. Lots. Drain tofu from storage water. Line one dinner plate with two cup towels, folded in fourths. Place the tofu block on the towels, then top with two more folded towels, and another dinner plate which faces upward. Refrigerate for at least 2 hours with cans to weight the top plate. Leave in the refrigerator until well drained. Remove tofu from fridge, and slice into squares about 1/4 inch thick. Place on a hot non stick skillet. Begin to gently press the tofu with a flat spatula. Water will escape the tofu and evaporate on the hot skillet. Turn when the underside has started to brown and repeat. Continue pressing until the tofu is about halved in thickness and has a slightly meaty consistency. Cut into bite sized pieces. Heat olive oil in a large soup kettle. Saute onions until translucent, then add garlic to soften. Add celery and stir until it begins to soften. Add remaining ingredients except noodles, pressed tofu, and cilantro. Allow to simmer, on low, until the carrots are softened. Taste, and adjust seasonings as desired. About 20 minutes before serving, add the noodles and tofu and cook unti the pasta softens. Serve with chopped cilantro. I'm in the mood for soup, so I thinned this out a bit with more beer. If I wanted chili, I'd leave it very chunky. This is what I make when asked for vegetarian chili. I’ve got to say, it’s one of my favorite self generated recipes. I sort of touched and tinkered on it for a good long while and I think it’s nicely balanced and filling. I will say this is not something to make on a week day. The chopping and layering and sauteing take time. I like to let the vegetables simmer for a few minutes to create their own stock. Then I add the beer, crank the heat and let it reduce a bit before I continue building the soup. I think that makes the flavor a bit more rich. Take your time, it will pay off. The recipe makes about a metric ton of soup, so bring home friends. This will be dinner on Saturday night, along with some sourdough bread. If you’re in Austin please do stop by. A word about adobo sauce: It can sneak up on you. You may taste very little chilè when the soup is first assembled, and then not be able to eat it in a few hours. I start with adding one or two tablespoons of the adobo sauce, and then taste and work up as the cooking continues. If you can find them Fire Roasted Tomatoes (instead of plain canned ones) will add something here. Heat a large stock pot and add oil to bottom of the pan, just to cover. Saute onion until it begins to color. Add garlic, carrots and celery. Cook until vegetables begin to soften, adding a touch of beer if needed to deglaze the pan and keep things from sticking. Add mushrooms. Cook down, lid on, until mushrooms yield moisture. Add corn. Stir in chopped chili, adobo sauce, cumin, peanut butter, pepper, and salt. Saute for a few more minutes. 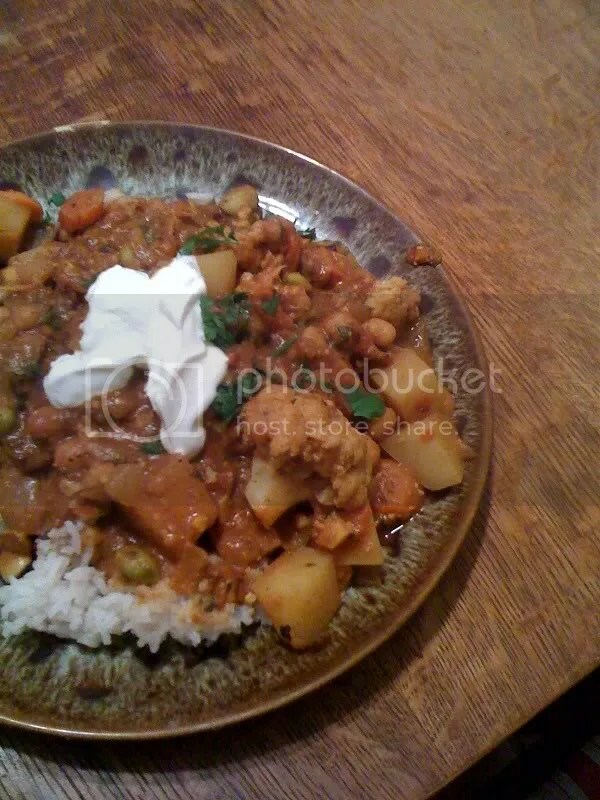 Pour bottle of beer into vegetable mixture. Add crushed tomatoes with juice. Add washed beans. Stir. Add reserved bean juice as needed. Bring to a boil stirring frequently. Reduce to simmer for 2 to 3 hours. Add chopped cilantro and lime juice just before serving. I served this with stewed cabbage, though it isn’t New Years. I love blackeyed peas, but I’ve always found it difficult to get them nice and savory without a giant hunk of yummy dead pig floating in the middle of them. The coffee seemed to do nicely here, giving the broth a little depth. In a large dutch oven, heat olive oil. Add onions and celery, mixing to coat with the oil. Clamp the lid on and allow to cook until softened, stirring occasionally. Add peppers, garlic, and ginger and saute until just tender. Deglaze the pan with the white wine, add coffee, beans and seasonings. Cover with water by two or three inches. Bring to a boil, then reduce the heat to a low simmer until the peas soften. Taste the broth and re-season as needed. If you must add water to the pot while it simmers, make certain it is near boiling. Cold water will cause the beans to split an the broth to muddy. to dry further. Add the crumbles. 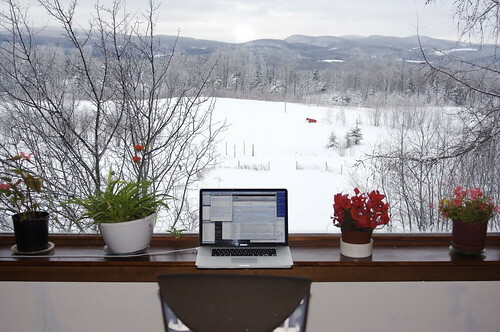 Warm through. Add seasonings. Add BBQ sauce. You may need to add a little more if it’s too dry. Cook till warm. Serve on buns. Sometimes, I make it without the crumbles and just double the onion and mushrooms if I’m going for super low calorie. With the crumbles, the filling is maybe a point on Weight Watchers. Get your cast iron dutch oven smoking hot. Turn the oven to around 500. Spray some no-stick in the dutch oven or add a tiny bit of vegetable oil. Saute the onions until golden add the garlic and saute just to soften the garlic. Remove them. Return dutch oven to the heat. Saute the mushrooms in small batches so they don’t get all sweaty. Remove the shrooms one batch at a time an add to the onions. Toss mushrooms and onions w/ the rest of the raw veggies in a mixing bowl. Deglaze the dutch oven with the beer. Add the worchestirshire sauce, lime juice, tomato juice, and seasonings to the pot. Simmer to reduce. Allow it to cook until you have less than half the original volume. It will be nearly black and kind of gritty from all the seasonings and burned on stuff from the pan. Add the veggies back to the pan (or put them in a baking dish if it’s too much for your dutch oven). Stir with the reduction. Pop it in the oven with no lid until it browns up. Serve on corn tortillas. Maybe add some guac, salsa, pico, or a touch of queso fresco. Saute the onion until soft with a bit of olive oil in a large dutch oven. Add garlic and peppers and stir until softened. Add beans to the pot and cover with water. Add seasonings. Bring to a boil and then reduce to a simmer for at least two hours until the beans soften. Add hot water as necessary to keep the liquid level constant. Adding cold water will split the beans and make the broth mealy. 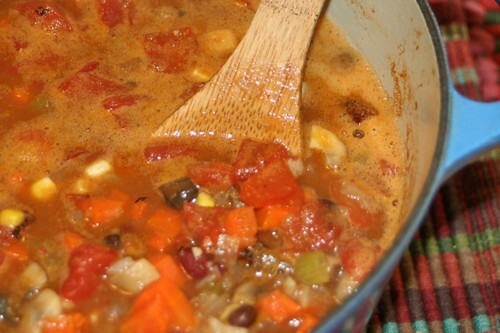 Combine the above and simmer on medium until reduced to desired consistency. It should be just thick enough to spoon over the casserole. Dip each tortilla, one at a time in hot grease. From the grease, place the tortilla on a surface lined with paper towel. Blot the tortilla with additional paper towel. Move the tortilla into a 9X13 inch baking dish. Roll cheese and onions into corn tortillas. Place the roll seam side down in a baking dish. (Rubber gloves would help if your fingers aren’t made of asbestos) Ladel the bean mixture over the enchiladas. Use only enough of the beans to cover the rolled enchillads liberaly. Bake at 350ºF for about 15 minutes or until cheese melts. Top with additional shredded chesse and onions. Bake until cheese topping melts. Combine tahini, lemon zest, juice, olive oil, and sea salt. Whisk in hot water to thin.